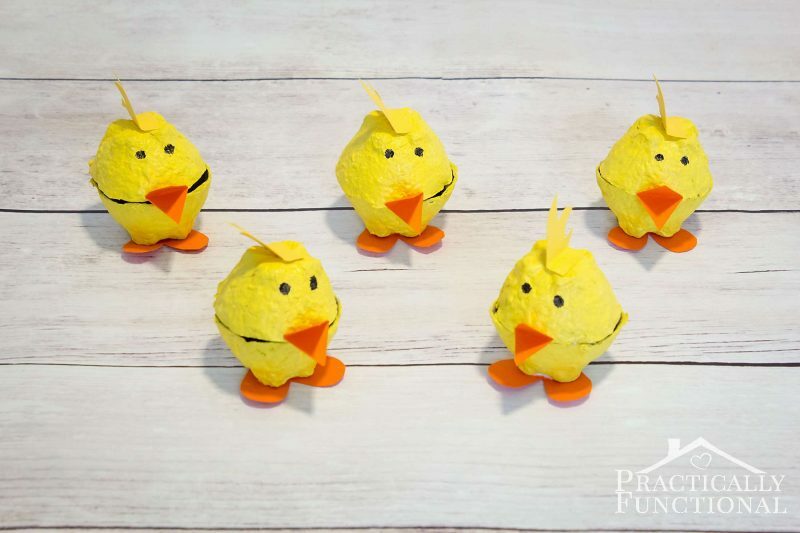 Make These Cute Egg Carton Chicks From A Recycled Egg Carton In Minutes! 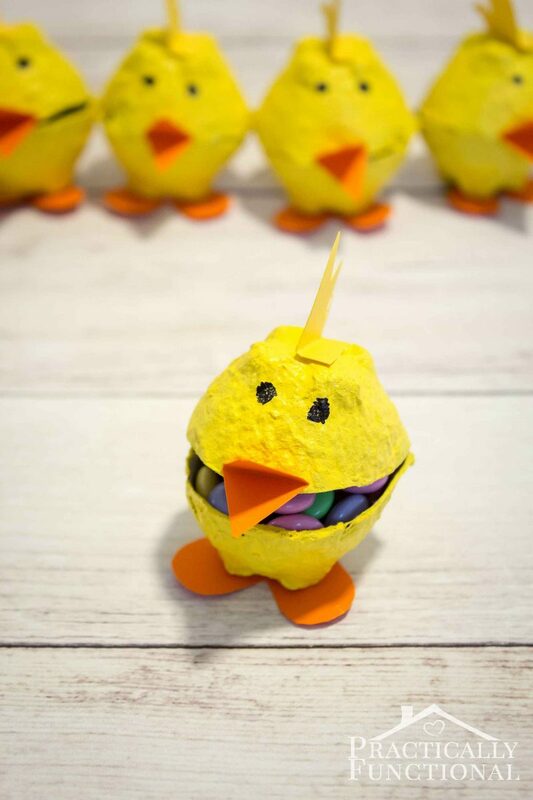 Home > Projects > Crafts > Make These Cute Egg Carton Chicks In Minutes! 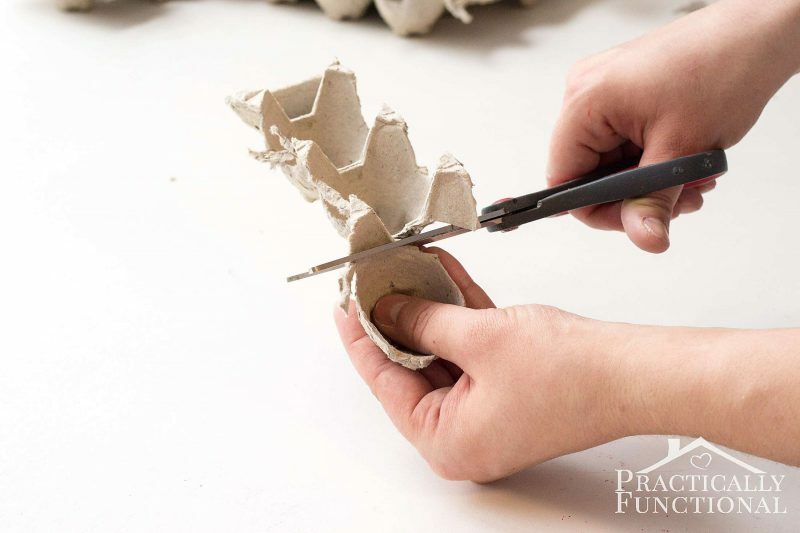 We go through eggs pretty fast in our house, and I always feel bad throwing away the egg cartons. I mean, I recycle them, but still, it seems like a waste. 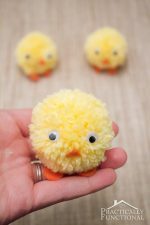 This week I decided to find another use for the egg carton, so I made simple egg carton chicks for spring! 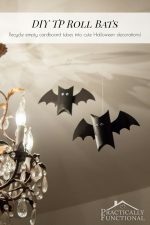 They’re super cute and easy to make, and the kids can even help if they want! 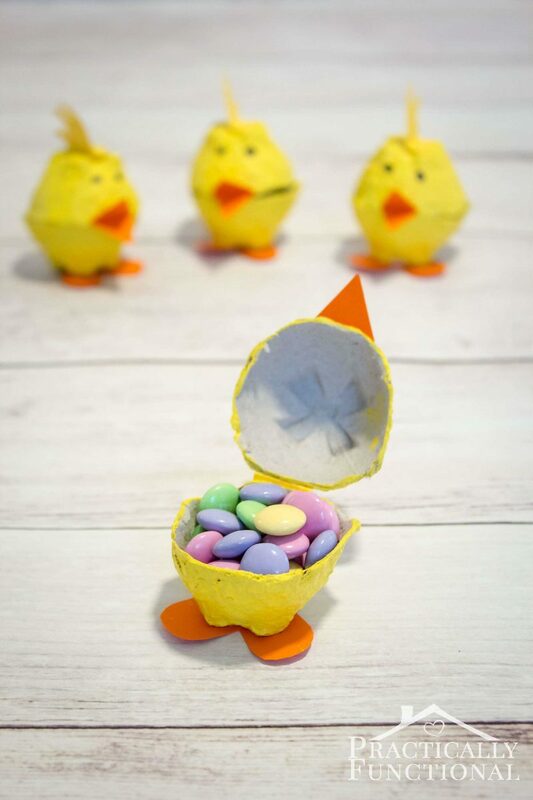 You can leave them empty if you want to use them as decor, or you can fill them with a few small treats and they’ll be perfect for Easter! 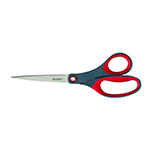 Start by trimming away the four tall parts on each corner of the little “cups”. You need two cups per chick. 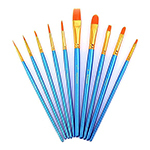 You want to end up with just the cups, and you want the top edge to be flat and level. 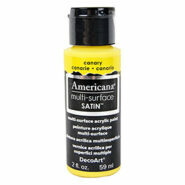 Flip the cups over and paint the outside with yellow paint. 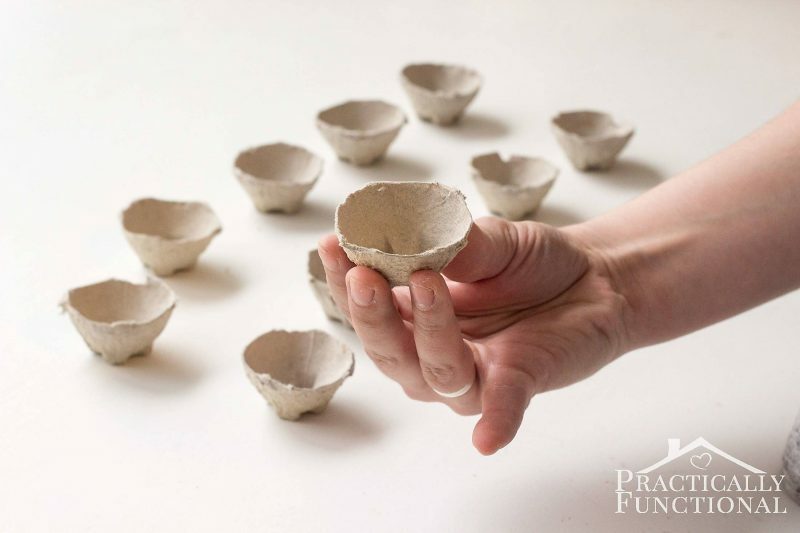 Set the cups aside to dry. 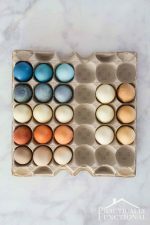 If you’re using brown egg cartons, you may want to do a second coat to make the color a little brighter. 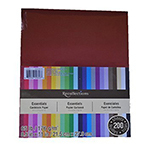 While the paint is drying, work on cutting up your card stock. 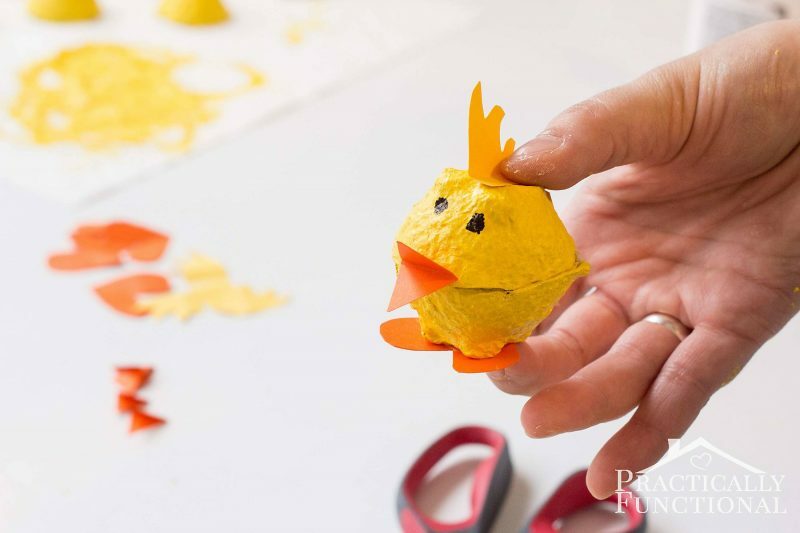 From the orange paper you need to make beaks and feet. 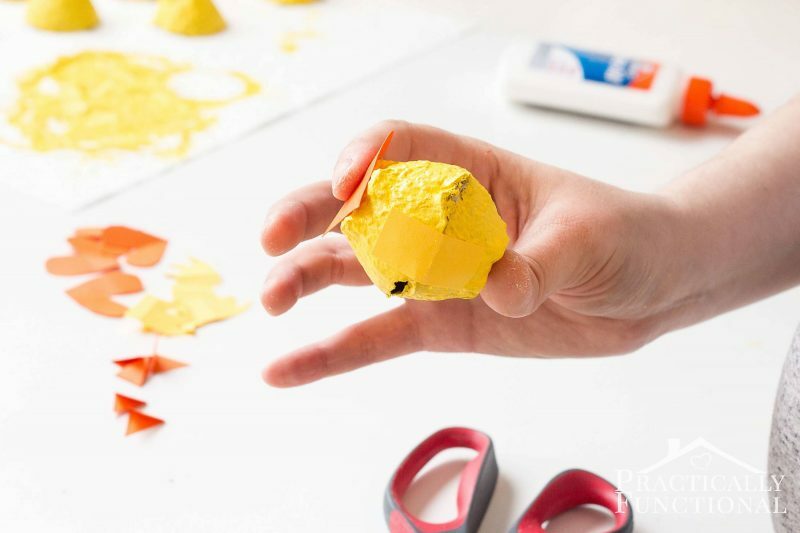 To make beaks, take a small rectangle of paper (about 1” x 1/2”), fold it in half to make a square, then trim away the corners of the paper so that when you unfold it you have a diamond with a crease in the center. 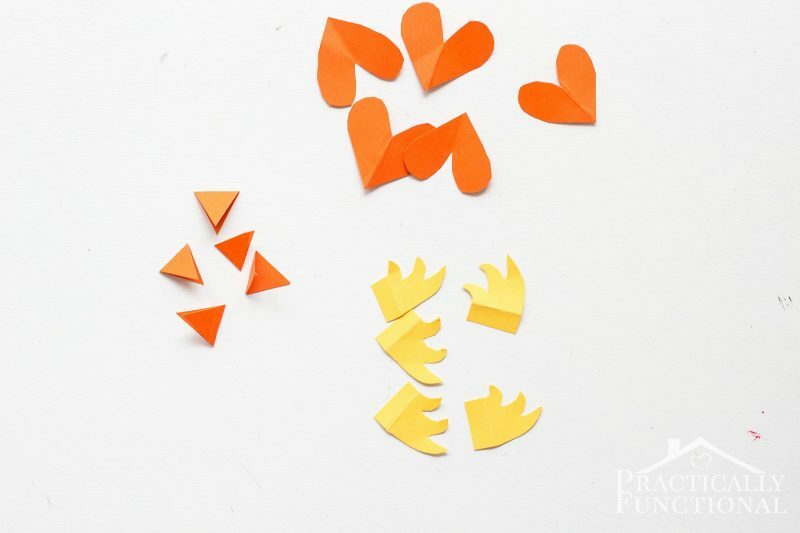 To make the feet, fold a small square of paper (about 1” square) in half diagonally, then trim the paper so that when you unfold the paper, you have a heart shape. 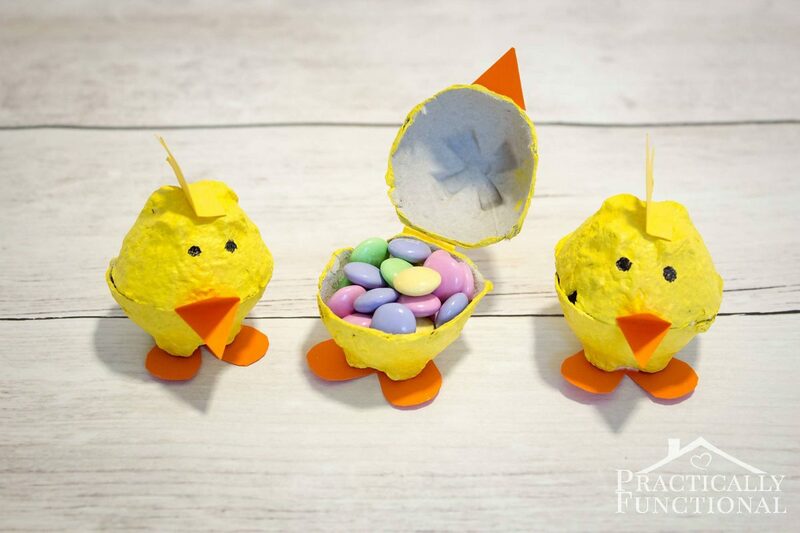 The yellow paper is for the feathers on top of the chicks head, and also for the strip of paper that attaches the top and bottom cups so that they can be hinged open if you put treats inside. 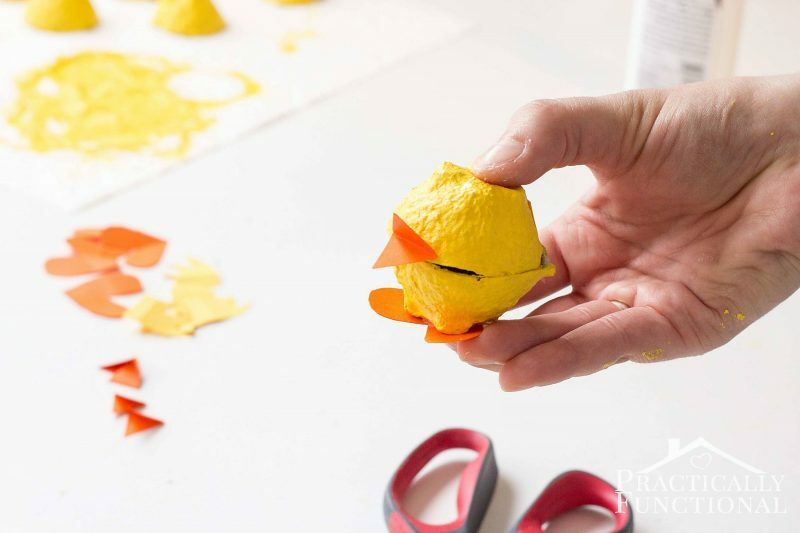 To make the feathers, cut a few feather shapes out of a small rectangle of paper (about 1” x 1/2”), then make a crease near the bottom so that the feathers will stand up straight once they are attached to the chick’s head. 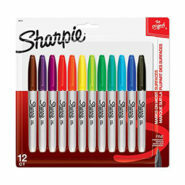 The strips of paper that attach the top and bottom cup should be 1” x 1/2” rectangles. 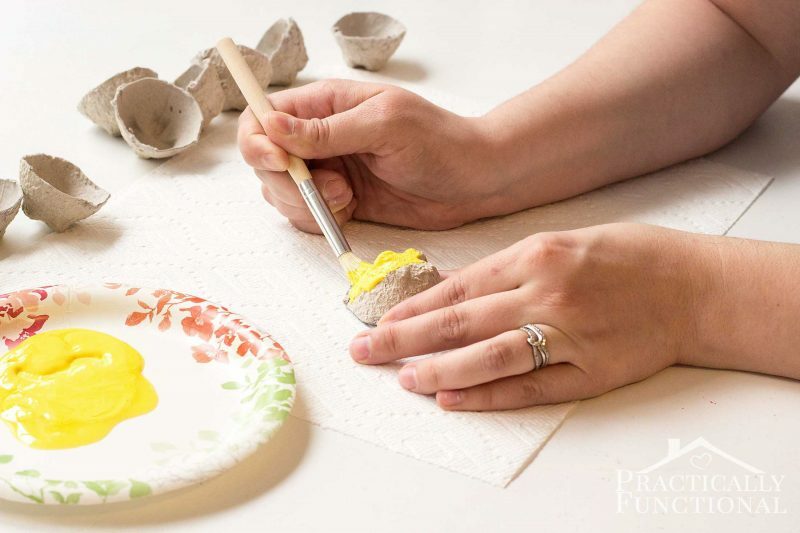 Once the paint is dry, glue the feet onto the bottom of one of the cups. 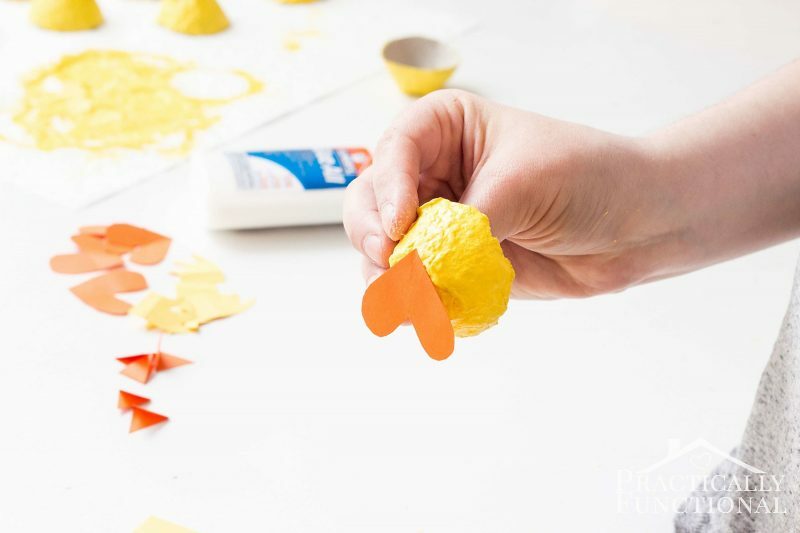 Glue the pointy part of the heart so that the “feet” stick out. 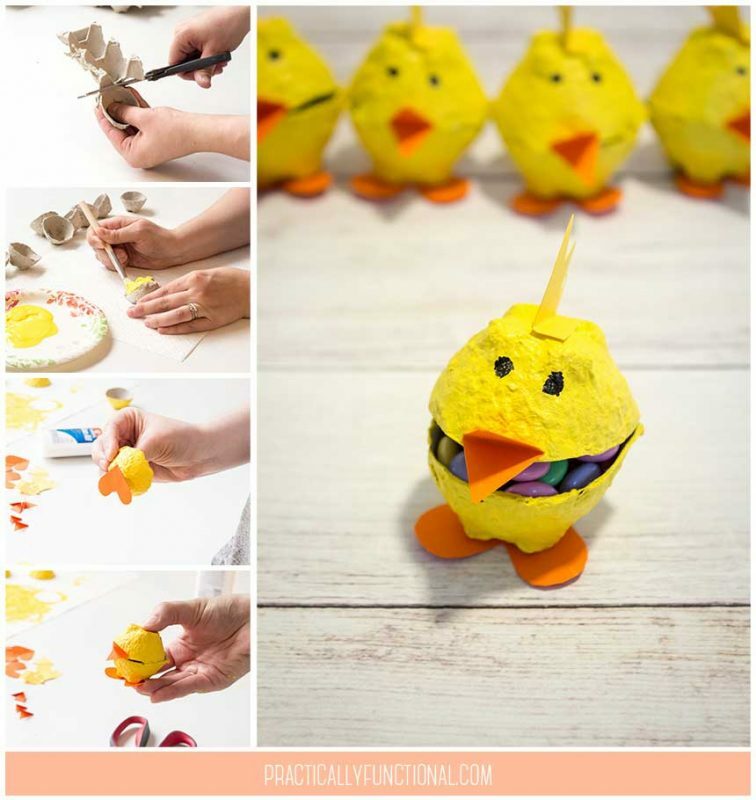 Glue half of a small strip of yellow paper to the back of the cup with feet on it, then glue the other half of the paper to another cup to make the top of the chick. 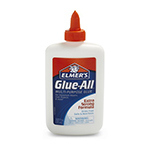 Put a thin line of glue on the fold of the beak and glue it onto the front of the top cup, right at the edge where the two cups meet. 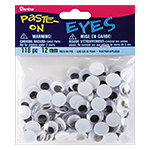 Glue the paper feathers onto the top of the top cup, then glue on googly eyes or draw eyes on with a black marker. 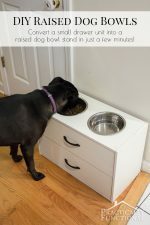 Let the glue dry for a few minutes, and you’re done! I found that a “fun size” pack of M&Ms fits perfectly into one of these cuties! 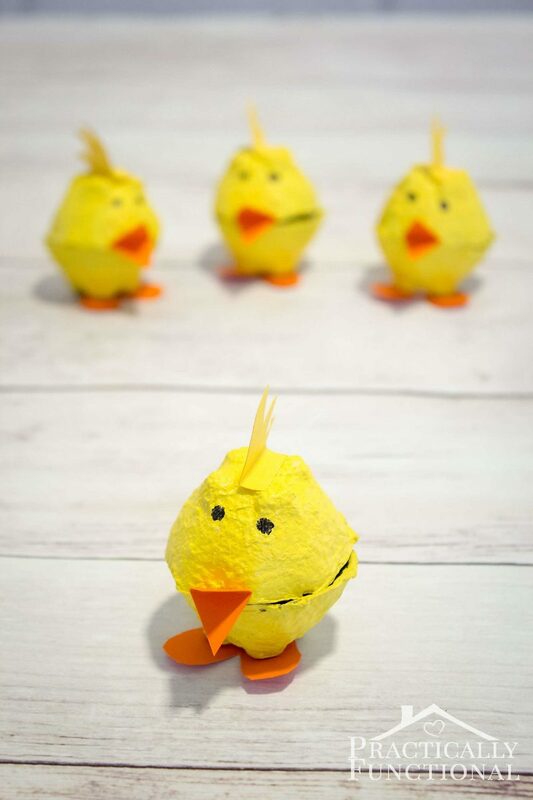 These little egg carton chicks are such a fun and simple craft, and they’re a great one for the kids to help with! 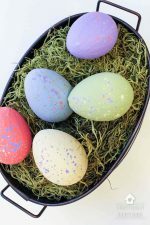 Use them as spring decor, or fill them with treats for Easter! 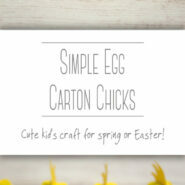 So adorable.Have lots of egg cartons. 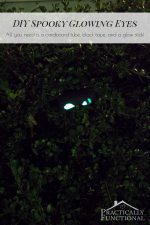 Don’t know how to deal with it. 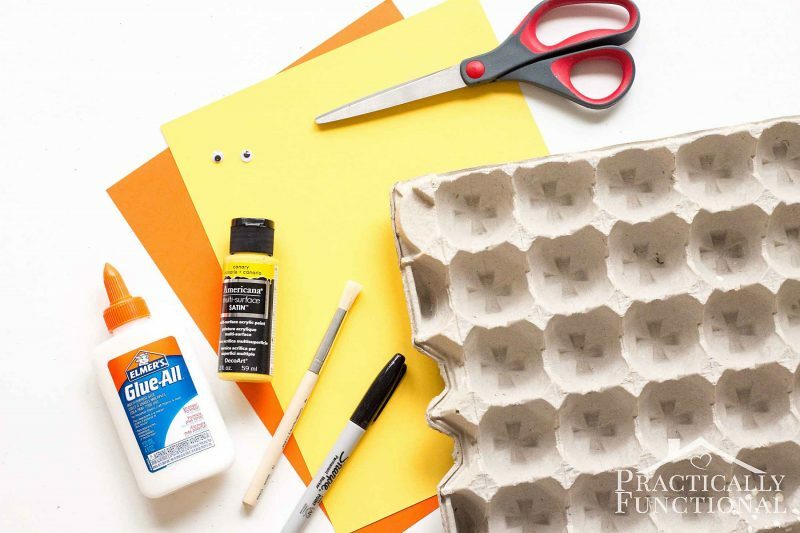 Glad i found this egg carton DIY projects. Perfect for my kids.